An iPod is not just for playing music, photographs or videos. You can use the secret iPod Note reader (Extras > Notes on iPod) like any other PDA or an ebook reader for reading PDF, Word documents, CHM or HLP help files, driving directions, offline Webpages, blogs, email conversations, song lyrics or any other file format that can be converted to plain text. The trick uses iPod Notes - a special hidden folder on iPod that's available when you select "Enable disk use" under the iPod preferences. Once the iPod is connected to your computer and set to be used as a hard disk, open Macintosh Finder or Windows Explorer and drag the files you wish to read in the Notes folder. How to read documents from iPod ? Turn Apple iPod on, go to Extras->Notes menu, open the first iPod notes file. All notes are automatically linked when created with above utility, so you can move from one to another just like turning pages of the book. » Adobe PDF - Adobe Reader 7 lets you save any PDF file as a text document. If you want only certain pages of the PDF on your iPod, select them with the marquee tool, copy to clipboard and paste it notepad. When Acrobat or Adobe Reader is not installed , use GMail to convert PDF to text. » Websites - Open the webpage or blog or even the RSS feed in your favorite browser and choose File -> Save As. In the save window, choose "Plain Text" under the save as type settings. » Microsoft Word - (or other Office programs) - Select File -> Save As and choose Plain text. When Microsoft Office is not installed , use GMail to convert doc, xls, ppt files to text. » Email - If you are using web based email like gmail or yahoo, open the mail which you'ld like to read in iPod and click the "Print Icon" inside the mail interface. This removes all the bells-n-whistles and gives a printer friendly version of the email message. Save it like you save a website in txt format. » Classroom lectures - If you have taken notes using OneNote on the tablet PC, save these OneNote documents as text files like any other Microsoft Office file. » CHM Windows Help files - Download any free CHM to HTML converter that convert the entire Winhelp file into multiple HTML pages. Alternatively, open the CHM help page that you want to transfer, right click and choose view source. Now save the file as a html file and then convert it to text. What are the limitations of reading inside iPod ? One major drawback is that you can only read in text format - no fancy graphics or HTML layouts. Second, iPods allow a maximum of 1000 files inside the notes folder with the size of each file not exceeding 4 kb. If your text document is larger in size than 4kb, it needs to be splitted into smaller 4kb files before transferring to the iPod. How to Split text files for iPod Notes ? Once you have saved your document has a plain text file, upload it here and click convert. This online service quickly breaks your document into iPod notes compatible sizes and puts them in a zipped folder. Just unzip this folder onto your iPod notes folder and you are ready to read on the road. If you open the text files with notepad, you may hate the formatting but they look reasonable inside the iPod. What else you must know about iPod Note Reader ? 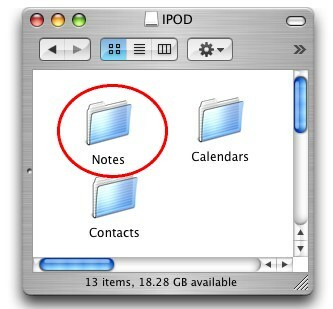 The Notes feature is available on iPods that have a dock connector like the iPod mini, iPod (with Dock Connector), and iPod (Click Wheel) models. The iPod Note Reader can display any plain text file. To display other language files like Japanese, Korean, or traditional or simplified Chinese, you will have to save the note as Unicode text and also set the iPod language preference not as Latin. • How to connect iPod to the TV ?